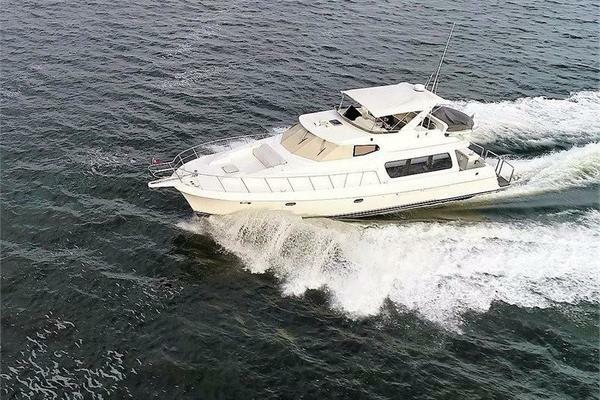 OWNERS HAVE FOUND THEIR NEXT BOAT AND WANT THIS THE NEXT 466 SOLD! The 466 Motor Yacht by Carver is a 3 stateroom, 2 head vessel that will accommodate a large family or a group of friends. The 466 Motor Yacht by Carver is a 3 stateroom, 2 head vessel that will accommodate a large family or a group of friends. The huge salon that includes a dinette, L-shaped couch (has 2 fold out recliners), loveseat that opens to a bed, breakfast bar, flatscreen TV and entertainment center. The entertainment center houses an extensive surround sound system. All creates a very nice living and entertaining area. The master stateroom aft features a center queen berth, ensuite head with separate shower stall and lots of hanging and storage space. Guest forward VIP berth features a centerline queen berth, a huge hanging locker, built in shelves and a private entrance to the head. The third stateroom features a single berth, privacy door, two storage compartments and a hanging locker. Her gourmet galley features a full size refrigerator with top freezer, 3 burner flush electric cooktop, convection microwave, and plenty of storage. The large aft deck with wetbar has plenty of room for full size furniture. This area is protected from the elements by a hardtop, plexiglass wing doors and removable enclosure panels. The flybridge, a few steps up, features a large "L"-shaped dinette, bimini with removable enclosures, serving bar. The three bucket seats at the helm rotate to face aft. This vessel has a Furuno depth/fish finder, Garmin 2010 GPS/Chartplotter and 2 VHF Radios. The Bridge is also air conditioned. Her engine room is extremely clean and well maintained. There is easy access to all her systems for routine checks and maintenance. Ana Marie also has a fuel polisher and a water maker for extended cruising. All AC units have been replaced. Additional high resolution photography available.